What Causes a Computer to Overheat? Keeping your laptop running at a cool temperature helps ensure that you'll get long life out of your components -- but sometimes it's hard to get a definitive answer on exactly what that temperature should be. GPUs manufacturers provide temperature specifications tested under controlled conditions, not in the laptops made by other companies purchasing these components. To know your safe temperature, you'll need to know your GPU specifications in addition to understanding your laptop and its operating conditions. While lab testing presents conditions your laptop will never encounter, manufacturer's specifications provide a starting point for establishing a safe temperature for your GPU, provided the manufacturer publishes this information. NVIDIA'S GeForce series and AMD's Radeon series dominate the GPU market, yet neither publishes thermal performance for its laptop GPUs. NVIDIA's support pages state that 105 degrees Celsius is the center of the general maximum operating range. Consider this the controlled conditions maximum; your safe temperature will be cooler. GPU manufacturers supply a number of laptop makers as well as providing aftermarket products for upgrades, so they have no control over GPU chip installation conditions. The age of your laptop, the amount of maintenance you perform on it and its general operating conditions all affect the temperature range that's safe for the GPU. Laptops used for video-intensive programs such as games, movies and image-editing demand more of your GPU, so how you use your computer affects its temperature. Laptops used for email, word processing and browsing websites with no video are at low risk of overheating. A contemporary laptop may have five or more temperature sensors built-in, one of which will assess GPU temperature. This sensor does not measure the GPU core as efficiently as the maker can in the lab. 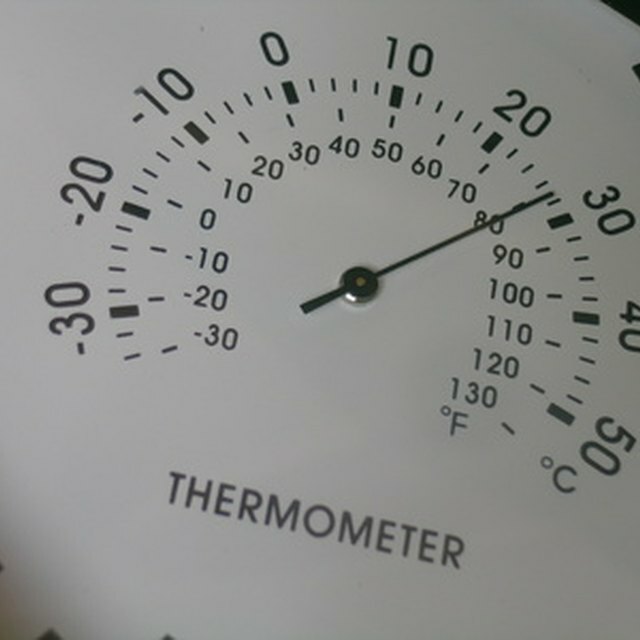 You can download many free utilities that report the readings from temperature sensors. GPU Temp, Speedfan and Open Hardware Monitor are three common programs. Use one of these utilities to watch the GPU temperature. Start your laptop and load the temperature reading utility. Take note of your laptop's GPU temperature with no other programs running. Expect a range of 40 degrees to 60 degrees Celsius, depending on startup programs. Load a graphics-heavy application, such as a game or video. Monitor the utility until the temperature stabilizes. If the temperature is below 90 degrees Celsius and your laptop feels warm to the touch but not uncomfortably hot, you can consider this temperature safe. If your temperature utility reports over 90 degrees Celsius, you may still be safe to run -- but since your reading is about 10 percent under the general maximum, take steps to optimize temperature performance. Clean your laptop gently, and consider a more robust annual cleaning with a qualified technician. Never operate your laptop on a soft surface such as a blanket or pillow -- this may block vents and prevent cooling. Use a laptop stand or cooler to improve ventilation. NVIDIA Support: Why Does My Graphics Card Run Hot? Shpak, Scott. "What Is a Safe GPU Temperature for a Laptop?" Sciencing, https://sciencing.com/safe-gpu-temperature-laptop-8560.html. 25 April 2017.